Spoiler alert: They’re basically all 23 years old. Official bios (and a little commentary) listed below. Want more snark? Check out our Bio Breakdown! We’ve set the three Bachelorette Groups for draft purposes: three groups of ten Bachelorettes each, and you must select ONE from each group. You will select your fourth Bachelorette after Episode One. Alex is the proud owner of a successful dog rescue business, which takes her all over the world in search of four-legged friends to save. To date, she’s saved almost 5000 dogs from slaughter. Luckily for Alex, rumor has it Colton is a dog lover, too. Per Chris Harrison, their shared love of dogs will be A THING. All I can see is that she looks like a brunette version of Howard Stern’s wife, Beth. A New England girl through and through, Alex was born on Cape Cod, went to college at University of Massachusetts and now lives in Boston. When she’s not cheering on the Patriots or the Red Sox, she’s working as an account manager for an IT staffing agency. Alex talks fast, but tends to move slowly … verrrrrrrrrrry slowly. Their hints are about as subtle as a jackhammer, y’all. She’s wearing a sloth costume. Angelique is a small-town Jersey girl with a love of corny jokes. Here’s one for you, Angelique: Why did Colton cross the road? To meet you, of course! I’m happy to see a pattern in a sea of jewel tones. Annie grew up on a farm in Wisconsin where she learned to ride horses. She competed in nationals for horse riding before attending the University of Alabama to study finance. Annie loves country music and swing dancing. She’s hoping to sweep Colton off his feet! Annie was one of the Bachelorettes who appeared on Ellen prior to Night One. So there’s that. We’ve got another print, and it’s a floral! I feel like the stylists are being very giving this holiday season. 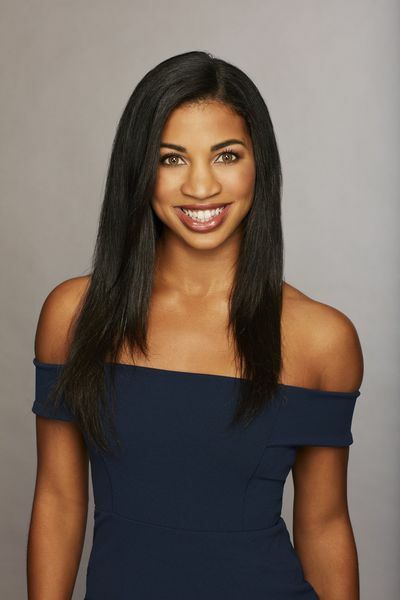 Caelynn grew up in Fredericksburg, Virginia, and attended Virginia Commonwealth University, where she got her degree in broadcast journalism. She was named Miss North Carolina in 2018 and was the first runner-up at Miss USA. But Caelynn is not your typical beauty queen. She once flew to Japan for a first date! Luckily, she’ll only have to travel to the Bachelor mansion to meet Colton. Caitlin is a successful realtor from Toronto, Ontario, Canada, who enjoys photography, painting and singing in the shower. Here’s hoping she musters the courage to belt out a few tunes in front of Colton … or, maybe not? Have you seen the preview? She’s the one who brings Colton a cherry balloon so she can pop it. Clever, right? Sounds like another Kaitlyn we know and love. A true native Californian, Cassie grew up at the beach and is an avid surfer. She is currently completing her degree in speech pathology and hopes to one day open up a private practice to work with kids. Maybe, in the meantime, she can teach Colton the language of love. Cassie’s standing next to Colton in the group photo above. You know who else stood next to The Bachelor? Lauren B. Just saying. By day, Catherine is a successful commercial real estate agent. By night, Catherine is DJ Agro – an up-and-coming hip-hop DJ making a name for herself on the Ft. Lauderdale club scene. Along with her dog daughter, Lucy, Catherine is hoping to spin her way into Colton’s heart. Chris Harrison mentioned that Catherine may be a villain. Also, she brings her dog with her, which is a good play, but…Kelly Travisty did it first! I dig that leopard belt. This girl is EXTRA, and I am here for it. Courtney was born in Wiesbaden, Germany, but grew up in McDonough, Georgia, with four younger siblings. She turned her passion for food and cooking into a successful catering business, crafting healthy meal plans for athletes. Now she’s just hoping she has the recipe for love with Colton! According to Chris Harrison, Courtney brings peaches on Night One (as a fellow GA Peach, I appreciate a good peach pun), and Colton straight up doesn’t know how to eat it. Demi grew up in rural Texas and is a proud country girl. She loves ATVing, fishing and watching WWE. She can also drive a stick shift. She’s ready to put her pursuit of Colton into overdrive! Keep an eye on this one, Bachelor Nation! Is “I can drive a stick shift” now one of those things you list in an “interesting things about me” game? Because I think that makes me old. My second car was a stick shift. Finally, she’s the one in the yellow high-low two piece ensemble in the group picture above. That’s…quite a decision for Night One, Demi. Devin graduated from Arizona State University with a Master of Arts in sports journalism. She currently works as a broadcast journalist for a local news station in Medford, Oregon. When she’s not reporting, you can find her doing her best sun salutation in yoga class. Namaste, Colton! According to Chris Harrison, Devin cries a lot. Elyse grew up outside of Anchorage in Soldotna, Alaska, where she spent her childhood ice-skating and snowmobiling. She found a warmer climate when she relocated to Scottsdale, Arizona, where she now works as a makeup artist. She also he enjoys hiking, reading and spending time with friends over good food and wine. Oh, Elyse. THERE WILL BE TEQUILA. “The Nut,” as she’s known to her friends, is a ball of energy with a great sense of humor. Erika boasts that one of her talents is being able to eat whatever she wants without gaining weight. What’s your secret, Nut? I think she brings a bag of nuts to Colton on Night One? There’s a dirty joke in there somewhere. Also, she’s about to fall out of that top. Erin works full time for her stepmother’s home improvement business. She’s not afraid to get her hands dirty but cleans up nicely. When she’s not working, Erin enjoys ballroom dancing (as long as it’s not too late of a night). Erin also loves expensive shoes but admits she can do a better job keeping track of them. She loves pumpkin spice lattes. This is the strangest bio I’ve ever read, y’all. I mean, if she’s a princess for kids birthday parties, I’m all in. But say that. This is just a bit too cheeky for my taste. Born and raised in Tuscaloosa, Alabama, Hannah was bred to be a proud member of the Alabama Crimson Tide. Following in her parents’ footsteps, she recently graduated from the University of Alabama with a degree in communications. She currently works as an interior designer and never misses an Alabama football game. Oh, and in her spare time this year, she won the title of Miss Alabama USA 2018. Roll Tide, Hannah! As a proud University of Georgia alumnus, I have zero love for this chick. This sweet Southern belle definitely isn’t camera shy – she’s both the photographer and model for her burgeoning social media business. Apart from planning the photo shoots for her next posts, Hannah enjoys being a foodie and glamping. Hopefully Colton “likes” what you’re putting down, Hannah! Guys. The notes I took during Chris Harrison’s video read only: “imm spk.” I have no idea what that means. Oh wait, I just figured it out! Immediate spark! Ha! She and Colton have an immediate spark on Night One. Whew. I’m not going to lie - I love her. She’s an Instagram star and she owns it. I can’t wait to watch her on my tv. Born and raised in San Diego, California, Heather is a Southern California girl through and through. She’s a thrill-seeker who enjoys bungee jumping, skydiving and river-rafting. But out of all the thrilling things Heather’s done, there’s still one thrill she’s yet to experience – she’s never kissed a boy! Heather, that’s not a job. It’s a Drew Barrymore movie. Also, who wants to bet that she kisses literally ALL THE GUYS in Paradise next summer? A native to Los Angeles, Jane is a free spirit with infectious energy. As a social worker, she uses her positive vibes and good nature to help care for seniors at an elderly day care facility. When she’s not at work, Jane loves spending time with her mom and dog, Bella. I don’t get it. I mean, if Jane is her middle name, that’s fine. But I need more information. A lifelong dancer, Katie attended Louisiana State University where she competed on the dance team. After moving to Los Angeles to work as a medical sales rep, Katie settled in Sherman Oaks, where she enjoys yoga and sushi. She still dances in her spare time and hopes to teach Colton a few moves. Ah, another SEC girl. Dancers are aplenty on this season, I think. This beautiful and spunky California girl works for her dad’s dentistry business as a dental hygienist. She loves hiking, reading, cooking and swimming. Her one deal breaker? Colton better floss. Originally from El Paso, Texas, this beautiful girl next door once moved to Spain on a whim. Luckily for Colton, she moved back and is ready to put her heart on the line for love. According to Chris Harrison, she wears the same dress as someone else on Night One. Guys, I’ve pored over Night One pictures, and I can’t freaking figure out who. Nicole is a fun and energetic Miami native who loves salsa dancing and singing acapella. Her family is originally from Havana, Cuba, and she’s extremely proud of her roots. She lives at home with her brother, mom and grandma, and can’t wait for Colton to try some of her grandma’s cooking. Apparently, she rivals Ashley I. in the tears department, so we’ve got that to look forward to. Nina was born in Croatia and moved to the United States with her mom when she was 9 years old, fleeing the conflict there amidst bullets and bombs. Amongst her many hobbies, Nina enjoys kayaking and hiking. She’s also watched “The Bachelor” with her mom and grandma for years. Chris Harrison told us that she speaks Croatian to Colton straight out of the limo. She’s lovely, and I think he’s going to find her super intriguing. Onyeka grew up in Manhattan, Kansas, in a loving family. Her parents are originally from Nigeria and have been married for 35 years. Fun fact:-Her parents got engaged after just two weeks. Onyeka is hoping to have that same kind of luck with Colton. Chris Harrison warns us not to get on Onyeka’s bad side. Apparently some of the other ladies do. I really dig her nail polish. Revian is an esthetician from Los Angeles. When she’s not helping people feel beautiful, she loves to attend music festivals. She’s also fluent in Mandarin. Per Chris Harrison, she’s a nurse by day, raver by night. Girl likes to party. Sydney has danced since she was 3 years old and is currently a professional dancer for an NBA team. She’s had great success in her career but hasn’t been as lucky in love. She’s never had a boyfriend! “Currently a professional dancer for an NBA team,” but Chris Harrison said she quit her gig dancing for the Knicks. So which is it? Tahzjuan grew up in Houston but moved to Colorado with her mom, brother and two dogs. She loves reading, outdoor concerts and shopping with her mom. Fun fact: She has a tattoo that says “I love bad ideas.” Hopefully, Tahzjuan only sticks to her good ideas when it comes to Colton. Lavender looks really, really lovely on her. This Southern California girl is definitely not the squeamish type – she draws blood for a living! When she’s not filling up vials for her patients, she volunteers at her church and goes wine tasting. Unlike her patients, Tayshia hopes Colton feels faint when he sees her! I need to know what highlighter she uses, because damn she’s glowing! Originally from New York, Tracy relocated to West Hollywood to pursue a career in wardrobe styling. When she’s not helping celebrities look their best, she’s traveling the world with her sister. She’ll be helping Colton with fashion tips all season long. That is a BOLD ensemble for cast photos - honestly, I don’t hate it. I admire her chutzpah. Also, she’s already being dragged online for problematic social media posts. The Internet is forever, y’all.